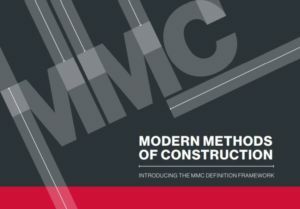 The Modern Methods of Construction (MMC) definition framework has been developed by a specialist sub-group of the MHCLG MMC cross industry working group. At the end of 2017, following a specific commitment made in the 2017 housing white paper Fixing our broken housing market, the UK government launched a cross industry working group. The group was tasked with supporting the mortgage finance, insurance and valuation communities in better understanding and supporting the greater use of Modern Methods of Construction (MMC) across residential development. That working group has been developing various outputs, one of which is a new categorised definition framework for different forms of innovative construction methodologies. This framework was established by a specialist sub-group led by Mark Farmer of Cast Consultancy, the chair of the wider MMC working group, supported by representatives of Buildoffsite, Homes England, National Home Building Council (NHBC) and Royal Institute of Chartered Surveyors (RICS). The intention is for this framework to regularise and refine the term ‘MMC’ by defining the broad spectrum of innovative construction techniques being applied in the residential market, both now and in the future. The framework also offers the opportunity to create more structured datasets capturing use of MMC and its performance, so enabling clients, advisors, lenders and investors, warranty providers, building insurers and valuers to all build a common understanding of the different forms of MMCuse. In turn this should enable confidence building through a better evidence base using the categorisation framework as a data taxonomy including the identification of building height typologies and primary structural materials used. The RICS will integrate this definition in due course into supporting guidance for its new Home Survey Standard, New Build Valuation Guidance and the next revision of the International Construction Measurement Standard. The MMC Definition Framework also supports the industry’s ability to evaluate the different ways available of increasing the ‘Pre-Manufactured Value’ (PMV) of its residential built assets in line with the government’s joint commitment with industry in the 2018 Industrial Strategy Challenge Fund Construction Sector Deal.